Sunaad is an eclectic group of singers from Bangalore city composed of the school-going and retired, professional performers and hobbyists, home makers and working professionals, all of whom share a common passion – a love for Hindustani classical music. Indian classical music in India tends to stay confined to the rigorously purist domains of the formally trained. As a result, the divide between the brilliance of the performers and the lay listener is wide. Sunaad tries to bridge this divide. By weaving in elements of theatre and story-telling into our performances, we have tried to demystify the complexity of classical music and make it more accessible to our listeners. We also seek to communicate to our audiences, the spiritualism and stillness inherent in our classical music traditions. 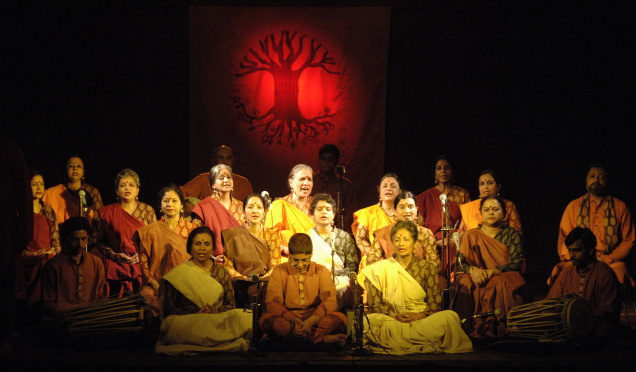 Sunaad has been guided by classical vocalists, Tara Kini and Aditi Upadhya between 2002 and 2005. Since then, Tara has led the group.